The New York Stock Exchange suspended trading at 11:32 a.m ET Wednesday and stayed down for nearly four hours. Trading finally resumed at 3:10pm ET. It's been a rough day for stocks. The Dow shed 261 points (about 1.5%), mostly because of China's stock market plunge and ongoing fears about Greece, although the NYSE "glitch" didn't help investor confidence. "Given the global paradigm of what's going on in the EU, Greece, China, this is the last thing that the U.S. equity markets need," said Peter Kenny, chief market strategist at the Clear Pool Group, a financial technology firm. Kenny worked on the NYSE floor for 25 years. What happened: In a brief announcement, the exchange said it was experiencing a "internal technical issue." 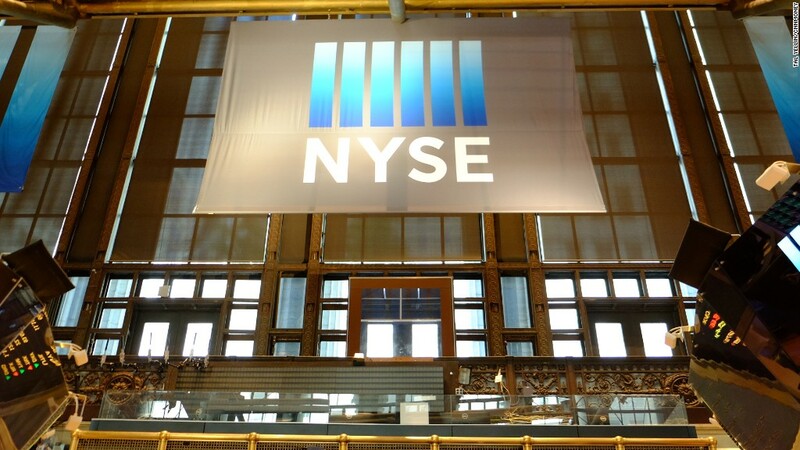 The NYSE said later in a tweet that it's "not the result of a cyber breach." "The root cause was determined to be a configuration issue," an NYSE spokesman said Wednesday evening. The Department of Homeland Security told CNN that there is "no sign of malicious activity" at the NYSE or with an earlier outage experienced by United Airlines. The FBI says it reached out to NYSE and "no further law enforcement action is needed at this time." Other exchanges, including the Nasdaq, remained operating as usual. In other words, investors were still able to trade trade, just not on the NYSE. "It is the most significant outage since Nasdaq's blackout [in 2013]," says Eric Scott Hunsader, a market structure expert and CEO of data company Nanex. The 2013 "Flash Freeze" caused all Nasdaq-listed shares to stop trading for more than three hours. Wednesday's halt re-hatches the long debate on electronic trading. Some experts believe there are more negatives than positives, but the NYSE halt revealed one of the benefits of electronic trading. "This is basically the good thing about electronic trading quite frankly -- the customer doesn't have to rely on any one venue," says Ted Weisberg, president of Seaport Securities, who has been working at the NYSE for several decades. Other glitches: The NYSE wasn't the only one with glitches today. The Wall Street Journal's homepage stopped functioning around the same time that the NYSE went down. The Journal was able to restore its homepage by about 12:20pm. United Airlines' computer system also malfunctioned Wednesday morning, but it was back up by the time NYSE had its big issue. Earlier in the day Wednesday, about 200 NYSE stock symbols halted trading due to a technology glitch, including Macy's (M) and Kate Spade (KATE). Traders thought that problem had been solved, but then the whole system went down. "They've been having problems all day. They seemed to have rectified it earlier and then it happened again. Now they shut it all down," said Joe Saluzzi, co-head of trading at Themis Trading and author of Broken Markets. 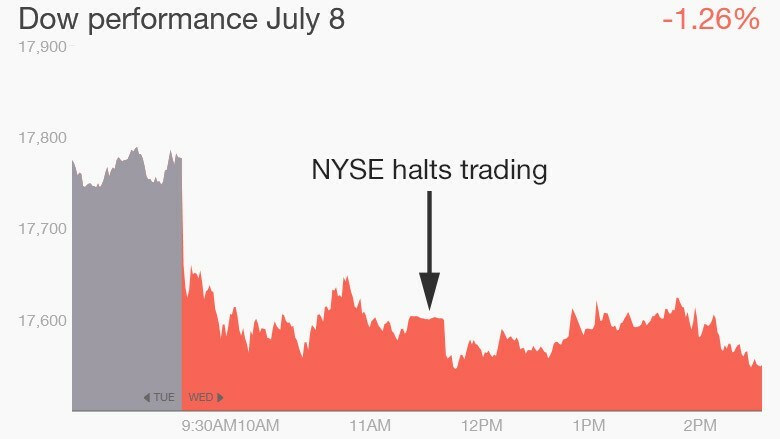 Trading is expected to resume on the New York Stock Exchange as usual on Thursday morning at 9:30 a.m.
CNN's Shimon Prokupecz and Jim Sciutto and CNNMoney's Alison Kosik contributed to this report.